Commissioned by Maharaja Takhatsihnji in the 1893 AD, Takhteshwar temple is one of the oldest temples in Gujarat. 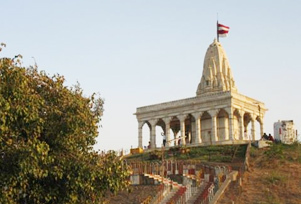 Takhteshwar temple is perched on a hillock boasts finest Gujarat style of architecture making it one of the most appealing temples in Bhavnagar. Supported on 18 ornately carved pillars, the temple has a beautiful main hall, featuring a three-eyed Lord Shiva idol. Magnificent courtyard of the temple, right below the 'sikhara', boasts exquisite marble work carving is noteworthy and boasts small statue of Nandi. One will have to pass through marble-clad pedestrian stairs to reach the main temple. From the temple, one gets to see the spectacular view of Gulf of Cambay. During the Shivratri festival, the temple is thronged by devotees from all over the world. Tourists should avoid visiting the temple during the monsoon and summer season as the climate remains hot and humid.